Dairy-Free Love is quite a tasty treat. Victoria Murdoch’s 60-minute, solo show has an innovative structure and uses the unusual strategy of creating what seems to be stereotypical character in order to force us to see past the stereotype and develop a complex response. The result is a delicious comedy with a delightfully bittersweet flavour. The premise of the show is that we are watching a young married woman named Dawn (Murdoch) in real time as she presents her nightly internet cooking show “Dawn’s Delights”. While Dawn actually prepares three dairy- and gluten-free desserts, her friendly patter reveals increasingly more personal information about her and her strange situation. We discover that Dawn’s husband Kalum (“K-Bear” to her) is the captain of the gigantic cruise ship Ocean Oasis and is away at sea six months of the year. Planning and preparing for her show is basically all that Dawn does every day. Since Tina, a friend from university does her shopping for her, Dawn never has to leave her house. In fact, the particular episode of “Dawn’s Delights” that we are watching is “celebrating” the fifth anniversary of the last time she left the house. In the episode we are watching Dawn prepares no-bake brownie bites (which she accidentally keeps calling “balls”) and a no-bake chocolate mousse with a macerated fruit salad. About the salad she says that the sour ingredients help bring out the sweetness. So it is with her show. Though her show is normally family friendly, Dawn decides to relate a few anecdotes related to her desserts that are a bit risqué so she advises parents to send their little kiddies to bed. Since Dawn is absolutely fastidious in appearance, behaviour and language, much of the show’s humour derives from seeing what convoluted linguistic paths she must take in trying to tell about Tina’s misadventure with ben wa balls and her own embarrassing first encounter with edible body paint. Director Susan Wilby and actor Murdoch set us up to regard Dawn as a ridiculous figure. Dawn has the values of a stereotypical 1950s housewife and dresses the part with a pink sweater, pearls and a beehive hairdo. 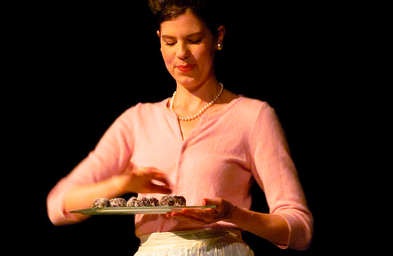 In the first half of the show we can’t help but laugh at her antique prudery and obsessive-compulsive behaviour. Her self-imposed language restrictions and her head-wagging at her little jokes make her appear as a silly person whose mastery of cooking seems her only achievement. When she takes time to answer her viewers e-mails live, however, we start to see how fragile Dawn’s bubbly façade really is. Murdoch is excellent at showing how the more Dawn explains how well she is coping with he husband’s long absences the more fear and doubt she is trying to hide. The more she tells us how she no longer needs to leave the house, the more she shows she is aware that she has cut herself off from the outside world. In this way the show presents as side critique of the internet as medium that supposedly connects people but, as in Dawn’s case, allows them to be totally isolated. Murdoch shows that while primness and desire not to lose control are part of Dawn’s natural personality, she is aware of how her attitudes have cut her off from life. Dawn’s promotion of dairy- and gluten-free cookery is meant to prove that a person can find substitutes to enjoy a full range of satisfying meals. The question is whether the substitutes Dawn has found to fill her life have actually left her satisfied. Thus, as the show progresses our attitude toward Dawn changes and it becomes impossible to see her as a fool when she reveals a growing sense of self-awareness. It is because Murdoch and Wilby take us through a process of reevaluating the central character and her situation that the show gains an unexpected richness. We change from laughing because we are so unlike Dawn to realizing that no one completely avoids feeling the isolation she feels. It’s a remarkable accomplishment for such a short play with such an unusual setting. Since the food-oriented show is staged in the Winchester Kitchen & Bar, the perfect way to enjoy it is to take advantage of one of the prix fixe menus the Kitchen offers at 7pm, an hour before the show. With the closure of such favourite small venues as the Alchemy Theatre and Artword, one heartening aspect of the Toronto theatre scene is the springing up of small, unusual venues such as this. A place that exudes such conviviality is an ideal place to experience a change in perception of someone like Dawn, from ridicule to sympathy to the hope that a better future for her lies ahead – or for anyone can attain some self-awareness. Photo: Victoria Murdoch as Dawn. ©2012 Alyssa Lai.